The Mahabharata rightly Declares: Gītā sugītā kartavyā kimanyaiḥ śāstravistaraiḥ – If you master the Bhagavad Gita, what is the need for a pile of Scriptures?” This is justly so for the timeless message of the Bhagavad Gita that was given by Lord Krishna to Arjuna in the battlefield of life is the very essence of all the scriptures – the Vedas, the Upanishads, the Mahabharata and so on. Immensely practical and thus the most popular of the scriptural texts through the millenia the Bhagavad Gita is an unparalleled self-transformation tool. 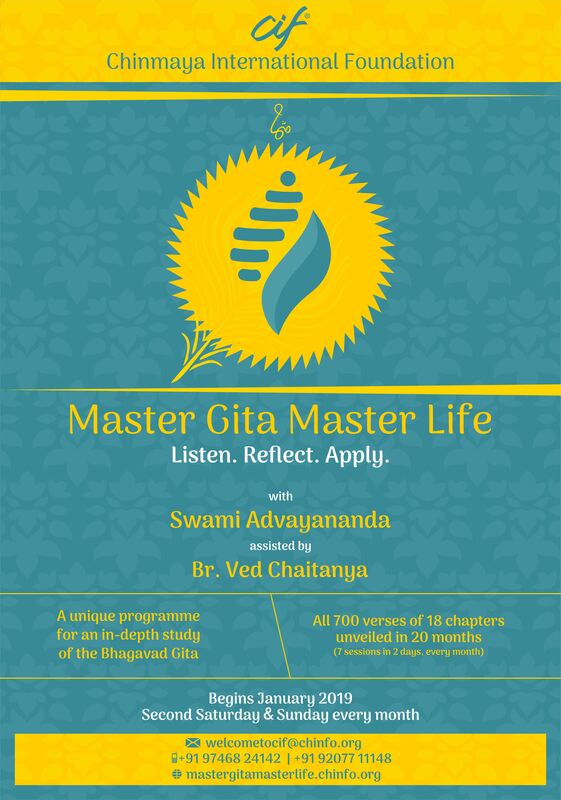 Mastering the wisdom of the Gita one truly masters the mind, life and the world. The programme will cover all 18 chapters in 20 months (additional 1 month each for the 2nd and 18th chapters). All the verses of the Bhagavad Gita will be detailed through discourses, followed by group discussions, Q&A sessions, and meditation sessions. Participants will also be taught Gita chanting. What greater fortune can there be than to study the Bhagavad Gita at the very birth home of Adi Sankaracharya, the abode of the Chinmaya International Foundation!